Our Annual Parish Lenten Fish Fry is fast approaching – just about a month away on March 24th, 5:00 pm to 8:00 pm. 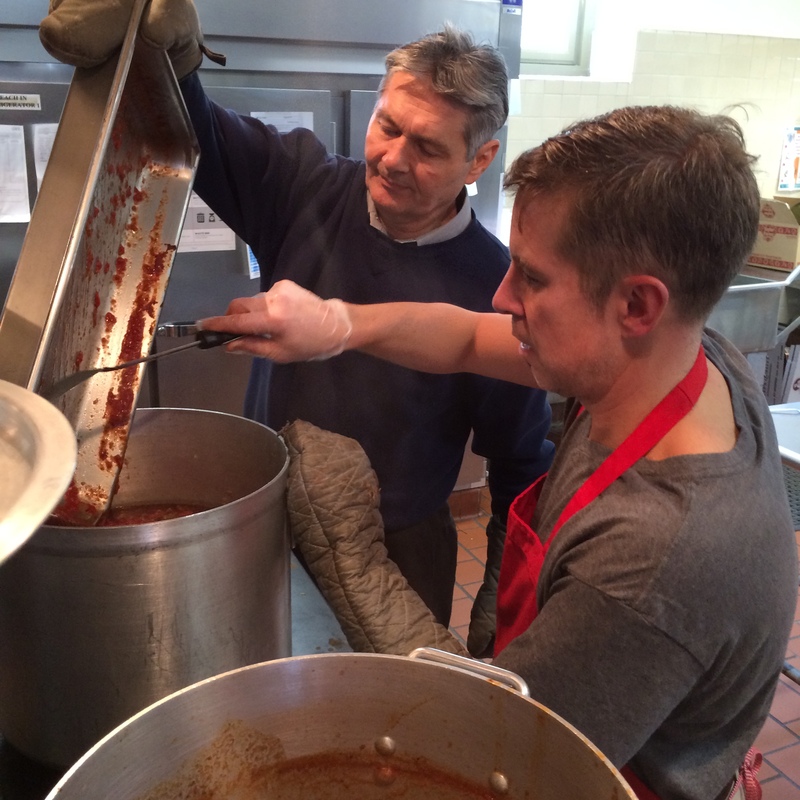 I am writing to ask again for your help at the Fish Fry by volunteering for one shift during the event. This will leave ample time in the evening to enjoy a great fish dinner and the fellowship of your friends and pew-mates! Many of you have volunteered for the “Fry” before and enjoyed it. I hope you will assist this year, too! Please ask your spouse to help, too! Shown below is a table of volunteer spots, and times needed. Please volunteer for any area in which you are interested! Folks shown in green means they are confirmed for their spot. For folks that volunteered last year, I left your names in the spots where you volunteered. If you want to serve there again, just let me know, and I’ll code it green. If you want to help somewhere else, just let me know. If you are unable to help, just let me know and I will take you off the sheet. Thank you for helping in any area at the Fish Fry! I look forward to hearing back from you! 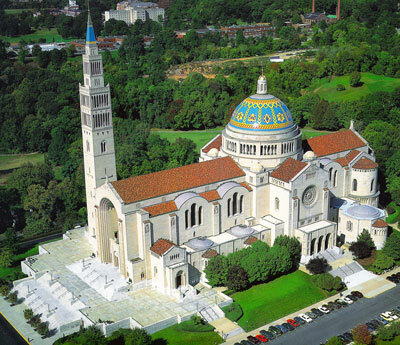 Here is our schedule for Saturday’s Lenten Pilgrimage to the Shrine of the Immaculate Conception (the largest Catholic Church in the United States) and the Shrine of Saint Pope John Paul II. As always, all of these components are optional and you can always spend your time visiting the bookstore, gift shop, or in private prayer in the Shrine or on the grounds. Please be on time, we need to leave on time so as not to be rushed. We are welcoming 5 men from St. Edward’s on the trip this year! Have you ever thought about joining the Color Corps? Now is the time! Your Color Corps needs you! The Richmond Assembly, #1165, has a long tradition of exemplary service to the community, especially through the Color Corps. As the Color Corps Commander, I am honored and privileged to continue that tradition. However, I cannot do this without you! We need trained Sir Knights who are willing to serve. I recognize that everyone’s schedule is busy. No Sir Knight is expected to participate at every event – we just ask that you serve when you can. Will you join me please? To me, there is no greater honor than to be present for the final mass of a brother knight. To attend a couple hours training session to be certified. Have color corps regalia, but you do not need to purchase it. The Assembly has regalia to lend to its participating members. The time to devote to a few events as your schedule permits. Thank you for your time and consideration of becoming a certified member of the Richmond Assembly Color Corps. Monsignor Carr’s 75th birthday a great success! I wanted to thank you and the Knights of Columbus Council 5476 Richmond for all that you did to make Monsignor Carr’s 75th birthday a great success! An enjoyable time was had by all! I can’t thank you all enough for all of your help throughout the party! We couldn’t have done it without you! Many thanks for all of your support, it was greatly appreciated by Monsignor Carr and our parish! Our Council is hosting a Formation Degree ceremony (2nd Degree) next Wednesday February 22, 2017 at 7:00 p.m. This is an excellent opportunity for any of you that have not obtained your 2nd Degree to do so. Please contact me as soon as possible if you are interested. Candidates should arrive by 6:30 p.m. Dress for the ceremony is coat and tie. Also, any brothers that would like to attend or assist with set up or the ceremony, please let my myself or GK Rick Witty know so we will have some idea how many brothers we will have in attendance. Congratulations to St Bridget parishioner Rolfe Trimble who recently joined Knights of Columbus Council 5476. He has been exemplified to the First Degree of the Order. Please extend your congratulations to this worthy Knight! 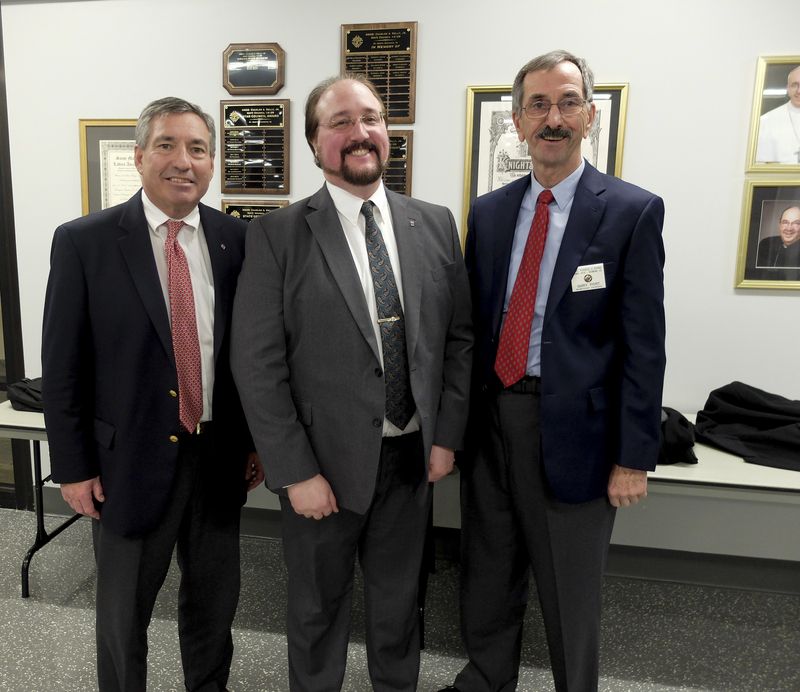 Pictured: Grand Knight Rick Witty, Rolfe Trimble and Membership Director Gary Port. The Knights of Columbus asks you good Catholic men …why are you not a Knight? We encourage you to join our ranks to serve our clergy, our church, our community and those in need. Contact Gary Port to learn more. Thank you Vicki and Dan! MATANIC, Dale Vincent, 62, of Richmond, passed away February 12, 2017. Dale was a proud member of the St. Bridget Men’s Ministry, where he served on the parish council. Dale was also an active member of the Knights of Columbus. He was a proud supporter of The Little Sisters of the Poor and worked alongside them to establish the Thrifty Sister’s store. He is survived by his son, Barry Matanic; two sisters, Nancy and Marianne Matanic and their families; and many friends. Family will receive friends Wednesday, February 15, 6 to 7:30 p.m. at Bliley’s – Central, 3801 Augusta Ave., where a Rosary will be held at 7:30 p.m.
A Mass of Christian Burial will be celebrated Thursday, February 16, 10:30 a.m., at St. Bridget Catholic Church, 6006 Three Chopt Road. 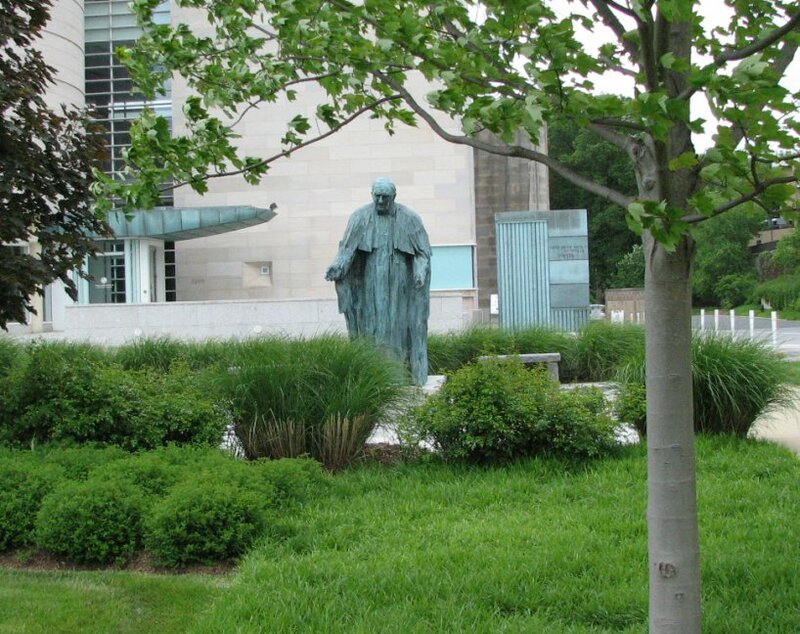 In lieu of flowers, memorial contributions can be made to The Little Sisters of the Poor. Nancy has posted a new announcement for Dale Matanic . Nancy Matanic has posted a new announcement for Dale Matanic . Dale Vincent Matanic passed peacefully this morning February 12 at 7:28. Although our hearts are heavy, we are comforted that Dale suffered no pain. Over the past days each of his family members were blessed to be able to express their love and say meaningful goodbyes. Dale touched so many lives in such a positive way. He is loved by many and will be dearly missed. You are receiving this message because you are a member of the community. If you feel that you are receiving this message in error, please e-mail a coordinator of your community. If that does not work, feel free to email support@lotsahelpinghands.com – we’re happy to help! Barry Matanic, Dale’s son, asked me to let you know that Dale passed this morning at about 7:30. Barry and Dale’s sisters Nancy and Marianne were present and Barry said it was a peaceful death. Ann and I arrived back from NoVa about 8:30 am and were stopping at the hospital anyway. We were able to visit briefly with Barry and family, and to say a few prayers over Dale. Thank you all for your prayers and support for Dalea and his family. They said it was very, very loving and reassuring in this tough time. So sad, but Dale is at rest in the hands of God! Order your 2017 Lenten Daily Devotional today! Subject: Fwd: Order your 2017 Lenten Daily Devotional today! As we begin preparations to commemorate Ash Wednesday on March 1, it reminds us that the liturgical season of Lent provides a wonderful opportunity to prepare ourselves for the Passion, Death and Resurrection of our Lord. Prayer is at the heart of the Lenten Season! It is our daily conversations with God that provide us with the grace for spiritual growth. Through prayer, we ask the Lord to open our eyes to those things of this world which may hinder our faith. To aid you in your prayer life this Lent, the National Shrine is pleased to offer our 2017 Lenten Daily Devotional. This day-by-day devotional will guide you through the daily Gospel readings from Ash Wednesday to Easter Sunday and also includes a suggested daily activity to aid you in your spiritual growth. We pray that this devotional will bring you closer to Christ through a daily commitment to Scripture and prayerful activity. We invite you to use our secure online form to request your 2017 Lenten Daily Devotional.